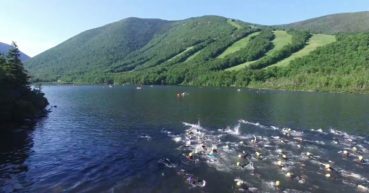 All White Mountains Triathlon Festival races swim within the beautiful Echo Lake, starting at the beach along the base of Cannon Mountain. Sprint (.25mi): One .25 mile loop in pristine Echo Lake. Olympic (1500 meters): Two times a 750m rectangle. Olympic Distance is two loops around the intermediate marked yellow buoys. Half (1.2 miles): Two times along a 6/10 mile rectangle for the half. 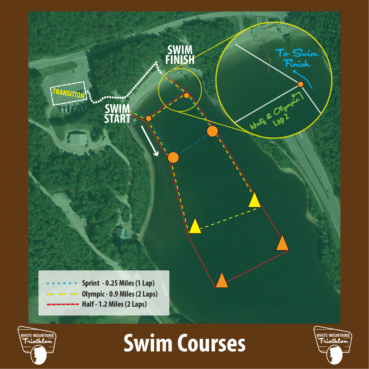 Half Distance is swim course is marked by two loops around the large orange buoys. Click Here to View Interactive Map! Wetsuits: Due to water temperatures typically in the low 60’s in June, wetsuits will be MANDATORY for all races. Wetsuits may be sleeved or sleeveless. Please Note: Olympic and Half swimmers will not exit the water between their first and second loops. All athletes will complete their first loop and stay in the water to begin their second. Sprint (7.25 mi): The Sprint ride of the begins with a quick decent of along Rt. 18 until a sharp right turn takes you onto Rt. 141. This is where the course starts climbing until riders cross under I-93 after a 1.5 mile climb. Riders will take a right on Rt. 3 and continue on the paved bike path as a preview of the final 2 miles for Sunday’s races. 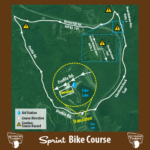 Aid Stations: There will not be an aid station on the Sprint bike. Aid is available at transition prior to and following the 7 mile bike ride. 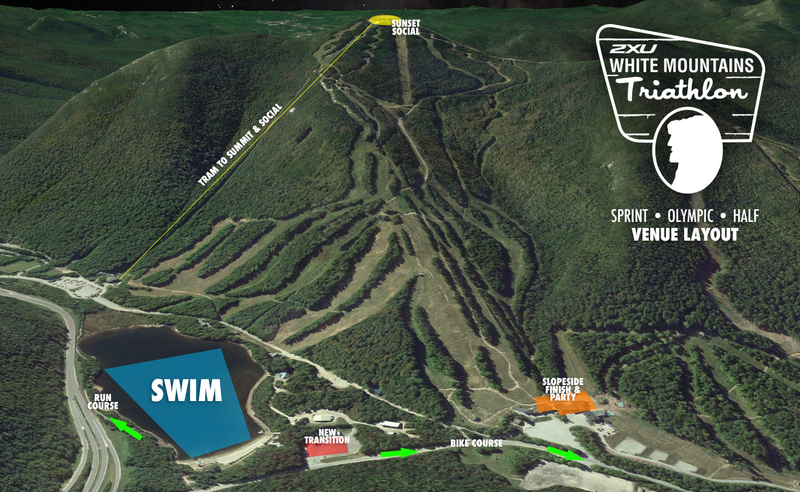 Click Here to View Interactive Sprint Ride Map! Olympic (40k): The Olympic ride begins with a 3 mile decent of 10% along Rt. 18 all the way in to and through Franconia Village. Turning into Bethlehem on Rt. 302, you’re in for an awesome section through the beautiful White Mountains. A turn onto Rt. 3 brings you back to Cannon and the transition area via a beautiful, paved bike path for the final 2 miles. Aid Stations: Aid can be found at miles 8 and 15. Water and Gatorade bottle exchange will be available. Click Here to View Interactive Olympic Ride Map! Half (56 miles): The Half ride begins with a 3 mile decent of 10%. It remains along Rt. 18 all the way in to Franconia Village prior to turning on scenic Rt. 116. While challenging, this part the route along side Lost River is where our famous “King of the Mountains” challenge awaits. Riders will turn around at the Beaver Pond rec area and head back into town. You’ll continue through the pristine White Mountains, turning onto Rt. 18 and continuing onto Rt. 302 into the town of Bethlehem. A turn onto Rt. 3 brings you back to Cannon and the transition area via a beautiful, paved bike path for the final 2 miles. Click Here to View Interactive Half Ride Map! 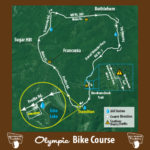 King of the Mountains Challenge: Our iconic KOM challenge begins at Mile 18 on the climb to Kinsman Notch’s Beaver Pond finishing two miles later. Aid Stations: Aid can be found at miles 20, 40, and 47. Water and gatorade bottle exchange will be available. 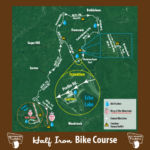 Run Course: All three White Mountain Triathlon Festival run course use the beautiful, paved recreation trail of Franconia Notch State Park. The series of paths weave and wind through the pristine terrain, affording athletes some of the best views in the Whites! Landmarks such as the Cannon Mountain Tramway and Old Man of the Mountain View Center are points of interest along your route. All runs finish at the base of Cannon Mountain’s main Peabody Lodge and lift area for a post race party and celebration. 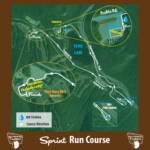 Click Here to View Interactive Sprint Map! 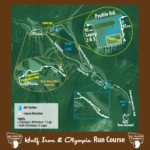 Olympic Run Course (4.25 miles) – is one loop of 4.25 miles. Click Here to View Interactive Olympic Map! Run Aid Stations: Aid stations will be available with Powerade, water, energy gel, and bananas.